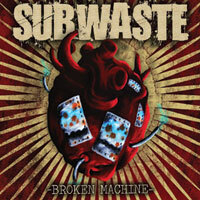 Orebro, Sweden's SUBWASTE, finally drop their long awaited brand new album “Broken Machine”! The three-chord Swedish punk rockers taking their adoration for pre-’80s liberty spikes and leather jackets to the extreme, yet kicking in just enough SoCal harmonies to maintain freshness. Broken Machine contains eleven knock ‘em dead tracks. For Fans of: One Man Army, Bombshell Rocks, Stiff Little Fingers!